This is according to two recent reports from FNB, namely the FNB Holiday Town House Price Index (4 May 2018) and the FNB Southern Cape House Price Index (12 Mar 2018). FNB property strategist John Loos said holiday home demand remained at “reasonable levels”, but retirement migration could be fuelling price performance as retirees move from Gauteng to the coast. “This Price Index continued to mildly surprise us during the first quarter of this year. From a revised average year-on-year rate of 6.7% in the final quarter of 2017, the index’s growth rate accelerated further to 7.5% in the first quarter of this year,” he said. Growth had slightly exceeded the national average house price growth rate. “It must be emphasised that nothing is booming at present - not holiday towns and not major metros. We are merely pointing to a mild ‘outperformance’ on the FNB Holiday Town House Price Index over the national index, but with both anchored in single-digit growth territory,” Loos said. He said one reason for the growth in holiday towns could be that affordability had improved after many years of under-performance and the comparatively higher prices in major metro regions. Cape Town and its nearby towns have seen significantly stronger house price inflation over the years than experienced in the Southern Cape Region. This means that home affordability (House Prices relative to Household Income levels) nearer to, and within, Cape Town has deteriorated more significantly than the Southern Cape, and indeed more than most regions in South Africa. The expected result, according to John Loos, is that a growing portion of “aspirant semi-grants” will search for more affordable residential regions with the quality of life they desire. It could make the Southern Cape a more desirable destination in the near future. Even with its limits from an economic opportunity point of view, for aspirant retirees it offers a very high quality of life and is more affordable than Cape Town these days. Also, it doesn’t have the growing congestion of the City of Cape Town and surrounds. “Traditional holiday town housing demand may become less about demand for holiday homes and more about demand for retirement and lifestyle - which may have previously headed for Cape Town in its more affordable days,” said Loos. 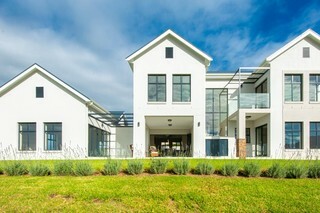 Finally, viewing the average house price growth of the 4 sub-regions of the Southern Cape, on an annual average basis in order to mitigate the small sample size, we saw the George-Oudtshoorn House Price Index showing the fastest inflation rate, to the tune of 17.1% in 2017, while the Mossel Bay Region’s Index with 12.7%. Bitou Municipality, which includes Plettenberg Bay, showed a still solid 9.77%, but Knysna appeared to be in the relative “doldrums” with price growth of 6.3%, the slowest sub-region, down from its previous level of 12.5%.